Atlantic salmon fishing on the Restigouche River begins around the second week in May and continues until the end of September. Earlier spring weeks can be arranged and unlike most private salmon camps guests are able to book trips in most of the weeks throughout the season at the RRL. We have broken up the full season into four parts to explain what guests can expect for Atlantic salmon fishing during a particular time of the season. Begin the second week in May into the second week of June. The Restigouche River has an early spring run of very large Atlantic salmon, Atlantic’s as large as any river in the world. 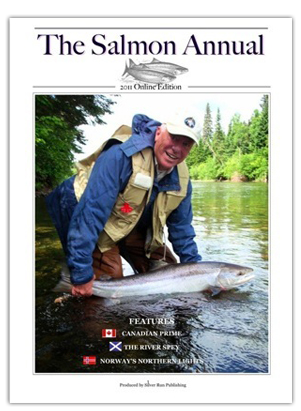 Chrome salmon in small numbers enter the Restigouche as early as mid April. This is only weeks after the ice out and coincides with the kelts readying for their return to the salt. Early in May a heavy run of smelt begin making their way in from the ocean on their spawning run. Following the smelt are sea trout, sea run brook trout that along with the kelts feed heavily on the run of smelt. At this time anglers have opportunities on all three. As we move to mid, late May and the early June weeks the numbers of salmon increase, for the most part all big Atlantic salmon in the thirty pound range and above mostly consisting of females, referred to as hens. Wet flies, large sizes, tubes or Waddington shanks with sink lines, tips and heavy leaders are in order. All depending on the water conditions at that particular time. Atlantic salmon numbers increase throughout the prime weeks. Salmon average in the high teens to the low twenties. 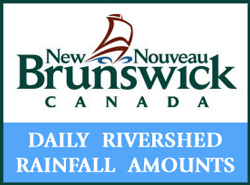 More male salmon are entering along with runs of salmon from the different tributaries of the Restigouche River. Around the end of June grilse also start to show up increasing the action. The third and fourth weeks in June along with the first week of July have always been covenanted by anglers as the most prized weeks by to be on the Restigouche. 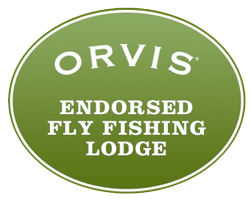 The RRL has spots available every year for anglers wanting to book one of these weeks. One clue is to book your trip very early. July into the end of August. Sight fishing in gin clear water, dead drifting dries or swinging wets just subsurface marks the type of fishing at this time of the season. As water and air temperatures increase Atlantic salmon seem to prefer the bombers floating on the surface, so be ready. The RRL’s resident fish, salmon that stay and spawn from our pools, take hold in July. Weeks from late August till the end of September. Atlantic salmon numbers increase on the lodge’s water late August into early September. Along with the resident fish salmon tend to drop down river although salmon from the salt have reduced to only a few individuals our numbers keep increasing. Atlantics with big kypes and brown trout looking colors start becoming more aggressive as the spawning season approaches. Salmon take both wet and dry flies according to the conditions.